ZTE and AT&T announced a new phone this morning, one that isn’t like your typical smartphone. Usually, a smartphone has one display and we’ll sit here and argue about its resolution or bezels or some other nonsense. 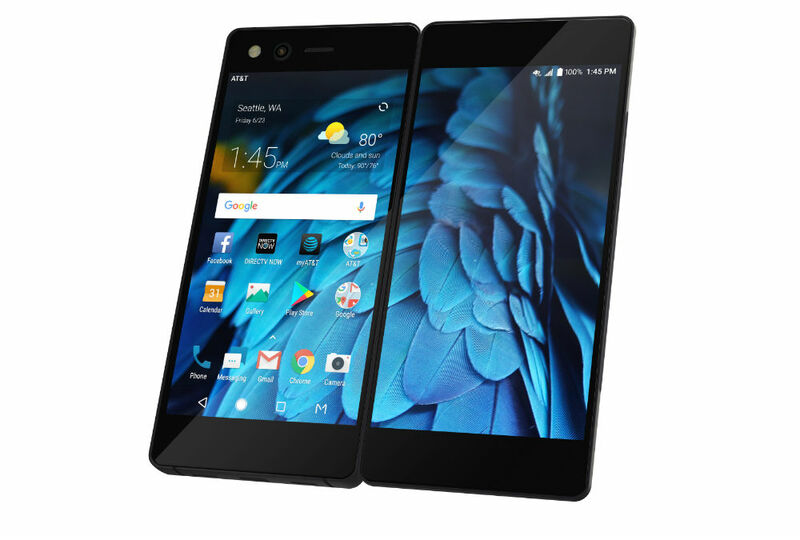 Well, the Axon M is quite different, sporting dual displays, both measuring in at 5.2″, with the phone featuring a foldable design. Yup, big things happening in the design department at ZTE, people! For specs, the Axon M offers dual 5.2″ FHD LCD displays, Snapdragon 821 processor, 4GB RAM, 64GB of built-in storage, Bluetooth 4.2, USB Type-C, 20-megapixel rear-facing camera, dual speakers, 3.5mm headphone jack, and Android 7.1.2 out of the box. As for what you can do with two screens, ZTE offers a few neat tricks, all focusing on either multitasking or sharing whatever it is you’re watching with another person. Here are specifics modes that come with the Axon M.
Dual Mode: Provides unlimited potential in app combinations so consumers can do more, all at once. With Dual mode, you can watch your favorite professional basketball team or PGA TOUR tournament on one screen, while ordering a pizza online on the other. Extended Mode: Stream, email and play games on a full 6.75-inch Full HD display. Extended mode lets you watch your favorite shows and movies on a larger screen, when and where you want to. Mirror Mode: Sit across from your friends and watch the same content on one device. Simply fold the device in Mirror mode and place it on a table for easy viewing from two separate sides. Traditional Mode: When you aren’t watching sports, catching up on your favorite shows, or surfing the web, Traditional mode gives you a great everyday smartphone that’s easy to use and hold in one hand. So, you’re either totally loving this or totally hating it. If you’re loving it, you’ll be happy to learn that this device will be available at AT&T stores next month, priced at $24.17/month for 30 months. That’s a full retail price of about $725. Please, share your thoughts below.